A warm October sun shines on the vines and fruit trees standing in neat rows in a backyard orchard in Pompeii. When Nero was Emperor, the family who lived here must have loved their little orchard, for they took full advantage of it, building an outdoor triclinium in its midst for al fresco dining. From here they could smell the sweet fragrance of ripening grapes and apples while enjoying a direct view of Mount Vesuvius. It was in late August 79 AD when the smoldering volcano finally exploded. As the ash started to fall, thirteen men, women, and children ran into this garden and huddled beside its tall stone walls, where they suffocated in the thickening air. Here they lay for eighteen centuries until Giuseppe Fiorelli, director of excavations from 1860 to 1875, dug through twelve feet of solid ash, pumped liquid gesso into the cavities left by the decomposed bodies, and created plaster casts of their contorted shapes. The experiment was a success. Death in Pompeii took on solid form. In the Orchard of the Fugitives (above) today, with its green grass, robust grape vines, and fruit trees, it is life, not death, that prevails, and the orchard is lovely once again. Ever more patches of green have come to life over the past decade as environmental biologists try to identify and recreate Pompeii's urban gardens. Down the street another vineyard adjoins the Osteria of the Gladiators, where four species of indigenous white grapes have been planted in soil that nurtured similar vines two thousand years ago. After a hot summer, the grapes are so full of sweet juice that the vines have to be covered with fine nets to protect the harvest from thieving birds. For harvest it they will. This vineyard is not just for show but is part of an ambitious effort to resurrect the vineyards of Pompeii and recreate the wines of the ancient Romans according to old Roman methods. The project- is a public-private partnership between the Archaeological Superintendence of Pompeii and the Campania wine estate Mastroberardino. Ancient frescos, root imprints, Roman authors, and DNA are used to identify the grape varieties. I've long been fascinated by the drinking habits of ancient civilizations—especially those of the Etruscans and Romans, who spread the grape gospel throughout Europe. I'd heard stories about those wild-and-crazy Romans: how they mixed wine with all kinds of ingredients, from honey to spices to seawater. I knew from Petronius's Satyricon that wine lubricated many a raucous banquet in Nero's day, that it was mixed with warm water and strained before being served, and that the ancients could be just as pretentious as today's wine snobs. "I give you, gentlemen, the genuine Opimian vintage," shouts the nouveau-riche freed slave Trimalchio in Petronius's satire, liberally pouring what he claims to be a one-hundred-year-old Falernian wine. "Yesterday I served much cheaper stuff and the guests were much more important." So just what were they drinking, and how did it taste? Pompeii's scientists and enologists have come as close as anyone to finding out. I decided to pay them a visit. 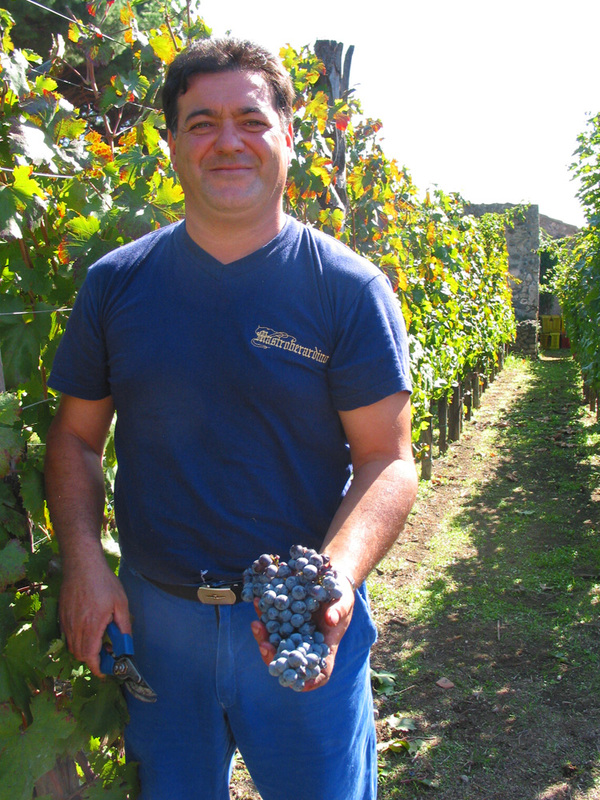 Piero Mastroberardino, managing the winemaking side of this public–private venture. Five months later, I'm standing under the umbrella pines on Pompeii's western periphery. It's harvest day in Pompeii, and I'm waiting for Piero Mastroberardino, the 38-year old winemaker in charge of the vineyards. His family was an apt choice for winemaking partner on this project. They've been working with Campania's grapes since the early 1700s and run one of the region's largest and most reputable wine estates. Their fame rests not only on the quality of their wine but on their unwavering dedication to Aglianico, Fiano di Avellino, Greco di Tufo, and other varietals brought here by the ancient Greeks. Many believe that without the elder Mastroberardino, Antonio, these varieties would have died out after World War II. I spot Annamaria Ciarallo, the environmental biologist who heads Pompeii's Applied Research Laboratory, and sidle over. 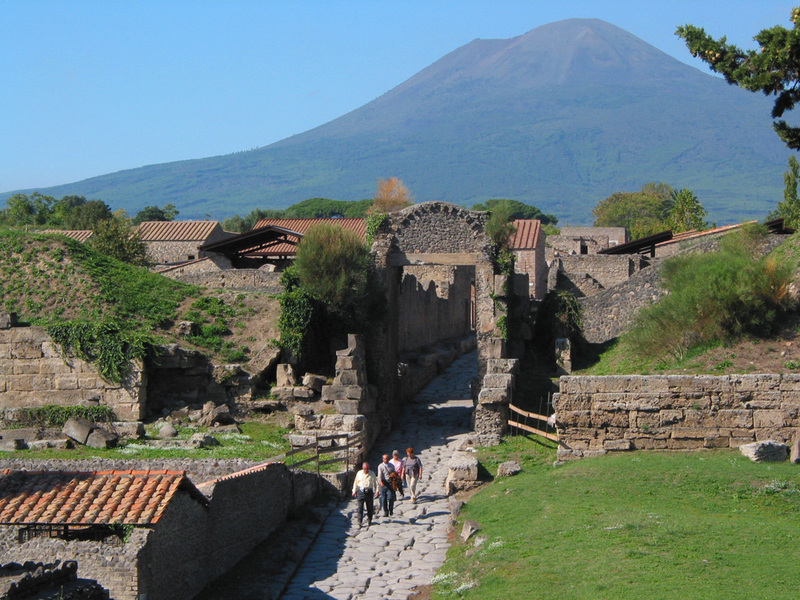 Remarkably, a third of Pompeii's 138 acres remains unexcavated. After the lab was founded in 1995, Ciarallo and her colleagues did quick work. Within a year they had discovered plots of land pockmarked by holes that were evidence of vines and their supporting stakes. The resurrection of these vineyards began in 1996. "It was born from an archaeological point of view," Ciarallo explained in Italian. "Our studies took off from the question of what the green areas were used for inside the city of Pompeii. We now know that inside the Grand Palestra there were sycamores. In other areas there were vegetable gardens or herbs for perfumes, and here there were vines. So this project started in order to have a better feel for the archeological site. This way, when visitors come and see the vines, they'll know there were vines here in the old days. And since we wanted to recreate the old vineyards, we thought why not make wine with the grapes?" I am surprised to see a dense concentration of vines here, unlike the mixed agriculture in the Orchard of the Fugitives. It's the location, Ciarallo explains, nodding in the direction of the coliseum nearby. "This courtyard was part of a private house, and they used to produce and sell wine to people who were on the way to the arena. For this reason we have the big triclinium." So this was, in essence, a public bar? "Yes, in fact. Clients would come and have a glass of wine. We have a lot of consumption of wine. This is the reason we don't find mixed fields around the arena." All five vineyards discovered by the research lab are situated near the coliseum, and many had comparable bars, some directly facing the street. Several also have a vinification room with a grape press; doli, or tall terracotta vats buried up to their necks for fermentation cooled by the earth; and an underground cantina for aging the wine. One can easily imagine gladiators stopping by for a quick shot on their way to work. The rowdy spectators certainly did. In 60 AD, a riot broke out between Pompeii and Nocera fans at the coliseum. It was so bad, says Ciarallo, that the teams were prohibited from competing in this arena for eleven years. It's a safe bet that wine played a part. So what did this ancient wine taste like? "Very strong," Ciarallo replies. "The problem is this: Wine in antiquity was used in a way that's different from today. We use it primarily to go with lunch or dinner. But in the antique world, it had also a medicinal value. For this reason, wine was usually diluted and spices were added during banquets. Or medicinal herbs were added, according to the sickness they wanted to cure." The Romans empirically understood the ability of alcohol to extract essential elements from herbs, she notes with admiration. 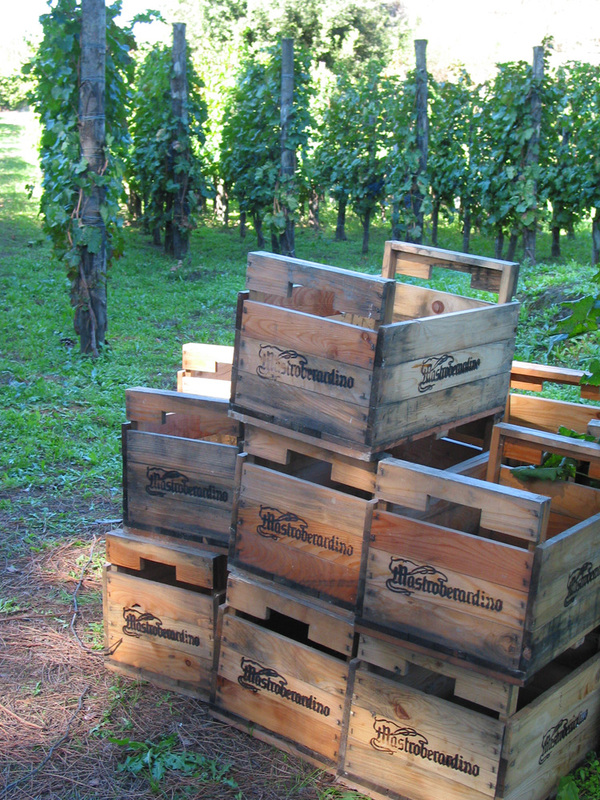 The wood crates emblazoned with Mastroberardino logos are already brimming with ripe purple grapes—Piedirosso and Sciascinoso, two varieties that will go into Villa dei Misteri, the wine named after a frescoed Pompeiian villa with an adjoining winemaking facility. "The wine we created is the closest possible recreation," says Ciarallo, "but obviously we don't dare reproduce some things that are typical of the antiques. I'll give you an example. Because the doli were underground, it was quite common for a little country mouse to fall into the vat and drown. Pliny said that if you find a mouse in your wine, you take it, roast it, and put the ashes back into the doli. Clearly, we'd never do this. Paradoxically, these are the things that create the difference between now and then." A lot was learned from Pliny the Elder, the Roman historian who wrote at length about agricultural practices before he died under Vesuvius's ashes. In Naturalis historia he lists the grape varieties then in common use. Eight were planted in Pompeii's first experimental vineyard in 1996: Vitus Aminea Gemina (or modern-day Greco), Vitis apiano (Fiano), Vitis hellenica (Aglianico), Columbina purpurea (Piedirosso), Vitis oleagina (Sciascinoso, also called Olivella), Cauda vulpium (Coda di Volpe), Vitis alopecis (Caprettona), and Falanghina. Pliny also made careful note of vine-training techniques, down to the distance between wooden stakes (1.2 meters). "Pompeii lets you verify what's said in the classical books," observes Ciarallo, who used Fiorelli's old method to make casts of the roots and stakes, thereby determining the height of vines and trellises. She also turned to the first-century AD writer Columella, whose almanac De re rustica forms the basis of her book Gardens of Pompeii. Columella's text is both a survey of agricultural work done over the course of a year and a compendium of recipes and advice on conserving food. Some are long-lost practices, like using gourds to store wine, water, and honey and protect it from children's prying fingers. Others are still in use, such as Columella's recipe for passito wine—adding dried grapes to fresh must, then pressing it after five days of fermentation—which resembles the production of Ripasso Valpolicella in the Veneto today. Both Pliny and Columella describe the shapes of grape clusters, which Ciarallo's team then identified in Pompeiian paintings of harvests and still lifes. According to the biologist, these frescos were scientifically "very accurate. The shape of the grape bunch and leaf has its own scientific branch of study: ampellografia. Every varietal has its own shape, even if to us they all appear alike. So looking at the frescos, we were able to reconstruct what the varietals here might have been." She adds, surprisingly, "This is much more precise than DNA, because DNA gives the species, not the variety." Taking the ancient texts, frescos, root imprints, and studies on climatic change, the scientists were able to come up with a solid hypothesis about the type of grapes found in Pompeii two thousand years ago. The next step was to grow the vines and make the wine. For that, the scientists passed the baton. Piero Mastroberardino watches his workers bring in the last of the grapes. Because of drought, harvest is two weeks early, but the grapes looked excellent. With a practiced eye he studies the Piedirosso, the dominant grape in Villa dei Misteri. This obscure varietal was already in Mastroberardino's holdings, used in the estate's prestigious Aglianico blend called Naturalis Historia in a bow towards Pliny. The Sciascinoso grape, on the other hand, was not in their regular fields—nor in anyone else's, for that matter. 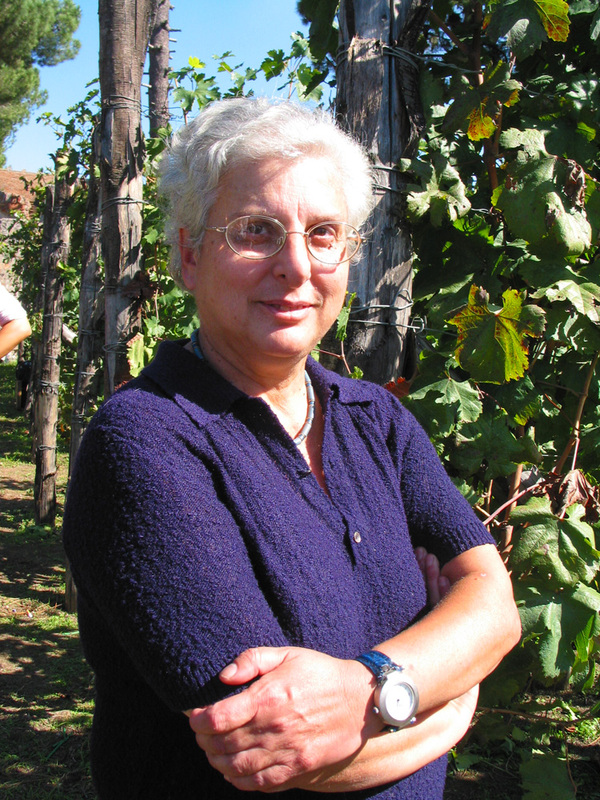 Sciascinoso "has almost disappeared," Mastroberardino noted, "so with this project we have the possibility of giving life to this ancient variety." Of the eight varieties planted in 1996, these two proved best suited to Pompeii's terrain and climate. So when it came time to expand beyond the first experimental vineyard, they were the chosen ones. The vines were planted following the old techniques, with a density of eight thousand plants per hectare (about three acres). In other words, Pompeii's urban vineyards are jam-packed. In contrast, Mastroberardino's inland properties have a density between four and seven thousand plants. In recent years, those numbers have been creeping higher throughout Italy as enologists realize the benefits of high-density fields. The competition for water and nutrients stresses the vines—which, paradoxically, is good. Lower yield means higher quality grapes. It took two thousand years, but enologists are catching on. The ancient wines of Pompeii and environs were, in fact, legends in their own time. "Campania wines were considered the wines of the emperors, the wines for events," explains Mastroberardino. Unlike, say, medieval monks who contented themselves with local product, the Romans were passionate epicures who took pains to locate and ship the best wine. "They were the first to introduce the DOC," Mastroberardino says, referring to denominazione di origine controllata rules that govern viticultural and labeling practices in Italy today. "On the amphorae of that period, you find the geographic origin of the wine, then the bolla, which is the seal of the producer, then the vintage." Marked with terracotta labels, Campania wines not only made their way to Rome but traveled to outposts as far north as France. But wines that made Emperors swoon would nowadays be spit back into the bucket, for honey and spices weren't the only added ingredients. Pine resin was also a conspicuous taste. Wine was typically shipped in terracotta amphorae coated with pine resin to make them impermeable, and the resin inevitably flavored the liquid inside. "We've done experiments with this, just to have an idea. But it's not drinkable," says Mastroberardino with a laugh. "The taste is very heavy. Not flavorful, because all these resins don't allow odorous substances to come out of the wine. So there was no smell, but rather a very intense taste on the palate." Without the resin, Piedirosso is quite compatible with modern tastes. "It's very fruity, but delicate and soft on the palate - like silk," observes Mastroberardino. "With a long maceration, it can have a good extraction of flavors. So you can have strength, concentration, and power, together with this softness and roundness. Today, as you know, that's something people look for in the taste of a good wine." Villa dei Misteri is thus a modern rendering of an ancient recipe. Mastroberardino has left out the pine resin and roasted mouse, the stems during pressing, and the unsanitary fermentation in open doli. But he preserves many of the old techniques. "We use an approach that is very simplified, with a late harvest, a long maceration, and a long period of refining in wood. Then it's bottled without filtration," he explains. The result is a ruby-red wine that's strong in density, and concentration. "The nose is very interesting, because it has some spices like pepper, and red fruits like raspberries, strawberries, and currants. These are typical of Piedirosso in the long maceration." Doli, where Roman's used the natural coolness of the earth to control fermentation temperatures, awaiting further excavation. I have to take Mastroberardino's word for it. Only 1,721 bottles of Villa dei Misteri were created from the first vintage and many were set aside at the wine estate for further aging, following Roman tradition. (Pliny recommends ten years.) All bottles available to the public from that 2001 vintage were auctioned off in May, 2003, with the proceeds going towards the restoration of ten doli and a wine press in the Foro Boario, Pompeii's largest vineyard. Over time the number will grow, but only slightly. This past year 2,440 bottles of Villa dei Misteri 2002 were released to restaurants and wine distributors, making it a bit more publicly available. But these bottles will always remain special ambassadors from those five acres in Pompeii-. I left the winemaker walking with his wife amidst the ruins and vines in the Foro Boario, carrying their children—the eleventh generation. Driving off, I fantasized about ways to convert my Brooklyn brownstone into an urban garden. Lemon trees on the fire escape? At the very least, I could cook apples and pears in passito wine, as Columella recommends. In the meantime, I buy a bottle of modern Piedirosso from a small producer near Naples and give it a try. It's silky indeed and shows wild-berry fruit, a nip of spice, and enough acidity to pair well with food. We raise our glasses and offered a two-thousand-year-old toast, courtesy of Petronius: "Lady Luck's in heaven and we're her little toys, so break out the wine and fill your glasses, boys!" Now that's timeless advice.